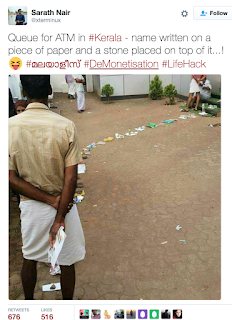 One evening in early November, unscheduled and by surprise, Indian Prime Minister Narendra Modi announced on a televised broadcast that the 500 and 1000 rupee notes that constitute 86% of all cash in India, would be worthless the next day. The announcement made on the very same day as the 2016 US Presidential election (perhaps a clever ruse to divert global attention) caused shockwaves throughout the country. To invalidate such a massive portion of cash in the economy was one thing; to enforce this just hours after the public announcement further shocked people. But this element of surprise was a necessary one for Modi's intention behind this drastic policy- that is, to eradicate 'black money', money that is sheltered from tax authorities and used in illegal activities. So Modi's announcement came so immediately in order to spread a wave of panic among agents of the black market. "There is no shortage of money in India, the problem lies in where the money is. ", the Indian Prime Minister asserted at a rally following the announcement. 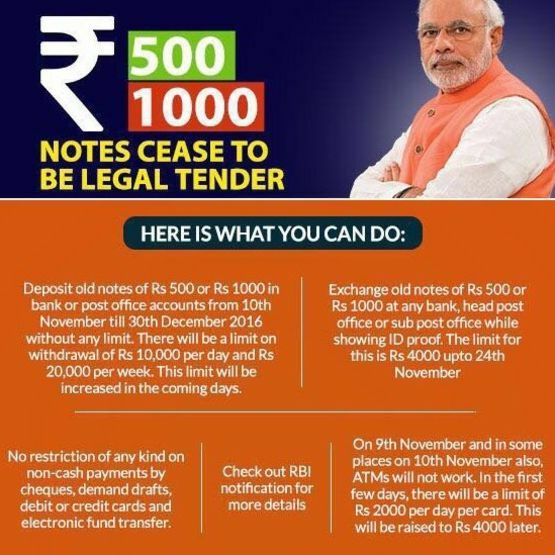 So anyone with 500 and 1000 rupee notes, from the 9th of November onwards, could not use it as legal tender. But, they could be used as deposits to bank or post office accounts, or they could be exchanged with sufficient ID at a bank or post office. This was not unregulated, however- you couldn't just go with all of your notes to exchange or deposit them. There were limits set on the amount you could make use of in one transaction or one day. "The poor who have welcomed the decision are sleeping peacefully, while those with black money are looking for sleeping pills." This was what Modi told his supporters at a party rally as he revelled in what he believes to be a successful implementation of his policy. The policy has indeed gone some way to weed out black money and illicit activities. Forcing people to 'register' their money by exchanging or depositing at a bank means they can be investigated- especially in suspicious circumstances, like if they try to deposit a massive amount into the bank at once. It allows the tax authorities to take register of potential black market agents. And indeed, numerous seizures of unaccounted money were made within just days of the demonetisation. But the major question to consider is whether this dramatic policy has been worth it. Because as well as the positive of criminals being exposed, there are a multitude of heavy costs this move has had on the Indian people. Firstly, it's highly questionable whether the poor are "sleeping peacefully" as Modi claims, because arguably more than anyone else, they have been hit the hardest by this. Cash is used for 98% of all consumer transactions in India, and the developing popularity of credit and debit cards, particularly among urban middle and upper class Indians, means that this figure is likely to be even higher when we consider rural lower class Indians alone. The rural economy is pretty much entirely cash based. One might argue, what is to stop these rural Indians going to their local bank or post office and exchanging or depositing the money? Especially to Westerners who have heard numerous stories of India's massive economic growth and development, this might be a pertinent question. But the primary issue here is hidden from us by the tall buildings of Delhi, Mumbai and so on. In the rural areas, very few Indians have neither bank accounts to deposit their 500 and 1000 rupee notes into, nor do they have the official documentation and identification to exchange it. Not only do poor Indians therefore lose significant amounts of their already pitiful savings, but their very livelihood is threatened. According to the Economist, over 80% of India's workers work in the 'informal' sector- that is, they are paid in cash. As a result, many of these workers may have not only lost significant amounts of what they have earned, but cash constraints mean many of them have been laid off by their employers, putting their future into freefall. What's more, those with the ability to deposit or exchange their money haven't exactly had a ball either. This has been one of the most shambolically executed monetary changes ever witnessed- lack of administrative capacity, and even a lack of cash money available to replace the outgoing notes, have resulted in massive queues and general chaos, reminiscent of a country in the midst of a bank run or severe economic crisis. Admittedly, this chaos has created sparked the creativity in many Indians. The days after the announcement saw record rail ticket sales, particularly in first class ticket seats for long journeys- suspected to be bought with 500 and 1000 rupee notes to return later on in exchange for valid currency. It has created some employment in the form of people paid to stand in queue for others. 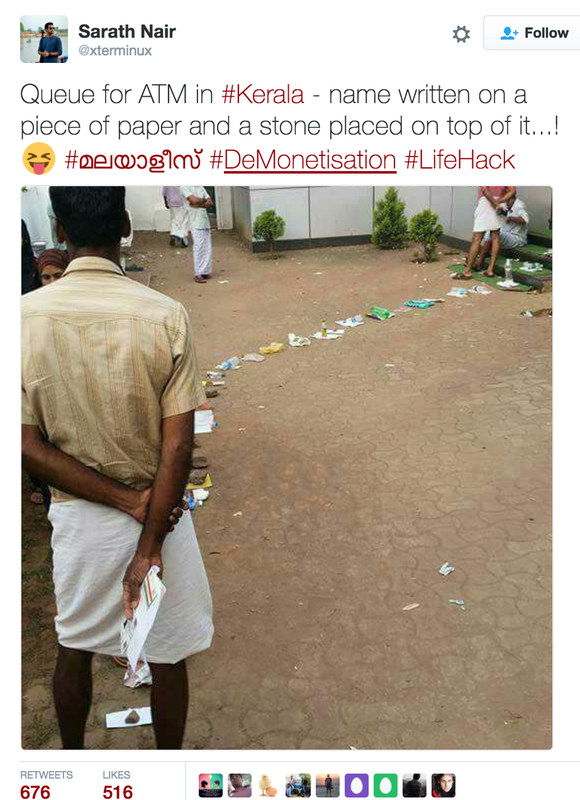 Those unable to afford this have simply put their name on a piece of paper, settled on the ground with a stone on top to represent their place in line. The restrictions on how much can be exchanged in a day have left many Indians reliant on cash struggling to afford their daily needs, such as food and rent. But there has been severe faults that put all the joviality into the shadow. 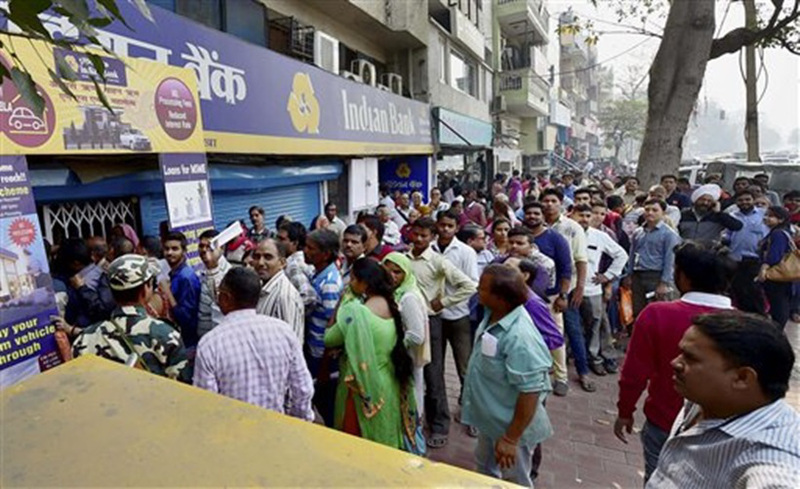 33 people died between the 8th and 18th of November, with their deaths directly or indirectly linked to demonetisation and the chaos that has ensued. Exhaustion in queuing and suicide has been one of the primary causes, but in more shocking cases, people have been left unable to pay hospital bills, leading to denial of service and in a number of cases, death as a result. Economic growth is also expected by most to be stunted as a result of demonetisation- forecasts for India's GDP growth have fallen by as much as 0.5%, and former Indian Prime Minister Manmohan Singh has stated that he expects GDP to fall by as much as 2% as a result of his successor's policy. 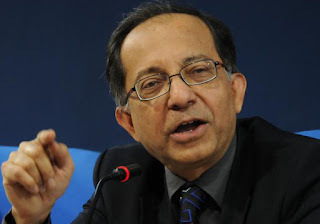 The scheme "will hurt agricultural growth in our country, will hurt small industry, will hurt all of those people who are in the informal sector of the economy", the former PM stated publicly. Concerns have also been raised over whether the policy will fulfil its intended role of weeding out the black market. Renowned Indian economist Kaushik Basu has claimed that the economics of the policy are "complex" and that "the collateral damage is likely to far outstrip the benefits". Raghuram Rajan, former governor of the Reserve Bank of India, believes that those targeted by demonetisation "find clever ways around it", meaning many remain perhaps inconvenienced, but unscathed on the whole. So far, the policy represents the Indian government failing in its duty to the poorest in the country. The middle and upper class are relatively well off- a survey done by the Government on a smartphone app showed 90% of respondents to be in favour of the move- the large majority of the Indian population unable to enjoy the luxury of a smartphone have gone unheard. There is almost no doubt that the rural poorer Indians are the true ones who have been hit, and hit hard. And even the wealthier, urbanites of India could be hit, as overall economic growth slows as expected. This all comes because not only does this policy represent bad economics, but its implementation has been poor. It makes one wonder whether the whole plan for demonetisation was just as rushed and immediate as its announcement.